1. We oppose the proposal for the revision to the EPS system in and of itself. - The Alliance is of the opinion that the Employment Permit System (EPS) must be abolished and a work permit system introduced. From this perspective, we cannot accept proposed revisions to the EPS unless they solve the fundamental problems inherent in the EPS. - As the explanation of the bill’s intent clearly shows, the bill is no more than a measure to “prevent permanent settlement” while adhering to the “principle of short-term rotation” migration and also enabled the “continued use of a skilled workforce”, desired by employers and the government. As such, we oppose it. - By conditioning extension of the sojourn period on migrant workers having not changed workplaces the proposed revision will lead to forced labor. As such, we oppose it. 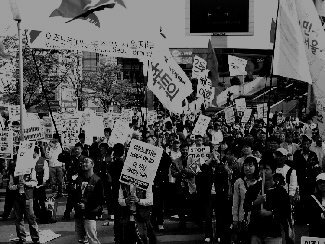 If this law passes the maximum period for which migrant workers can legally reside in South Korea will be extended to 9 years and 8 months. We have strong doubt as to whether a sojourn period of 9 years and 8 months can be view from the perspective of the principle of short-term rotation migration. In other words, migrant workers who can work in South Korea for 9 years and 8 months should be approached from a perspective different from the one guiding the policy of short-term rotation that has been in place until now. With respect to migrant workers in a regular documented status UN International Convention on the Protection of the Rights of all Migrant Workers and their Families calls on State Parties to, “take appropriate measures to ensure the protection of the unity of families of migrant workers” (Article 44). However, the proposed revision merely seeks to meet employers’ current demand for labor and fill future shortages in the labor market. There is no reference to the fundamental rights of individuals who live for an extended period of time as migrant workers. In other words, the bill treats migrant workers not as human-beings but merely as an economically active workforce. 2. At the very least Article 18-4, clause 1 must be deleted. - The opportunity for additional sojourn should apply equally to all migrant workers who have completed the first sojourn of 4 years and 10 months, provided they are not prohibited from reentering the country under the Immigration Control Act. - Making not having changed workplaces a prerequisite for extension of the sojourn period is likely to be used as a pretext for forced labor. It is likely that employers will use the threat of forcing workers to change workplaces (layoffs) as a means to force them to accept poor working conditions or violations of basic labor rights. For this reason, this provision must be deleted. To put forth a plan to enabling employers’ continued use of a skilled workforce while still preventing the permanent settlement of foreign workers by adhering to the principle of short-term rotation migration, and to induce foreign workers’ to work faithfully and return to their countries of origin afterward. In addition, to correct imperfections which have become apparent in the application of law, particularly with regards to the transfer of places of work. 1. The worker has not changed workplaces during the period of work allowed under Article 18 and Article 18-2. (However, in the case that the worker has changed workplaces for reasons stipulated in Article 25, clauses 1 and 2, he/she may be eligible for re-employment after re-entry if his/her contract with the employer who has applied for the permission for employment after re-entry is for one year or more leading up to the end date of his/her permitted period of employment activities). 2. The worker is employed at a workplace designated by the Minister of Employment and Labor as having significant difficulty in employing national workers. 3. If the worker has concluded a labor contract that is valid for a year or more begin on the day he/she begins work after having departed from and re-entered South Korea with the relevant employer. ② With regards application for permission for employment after reentry and the employment activities of workers under clause 1 of this article, the requirement that the employer makes an effort to employ nationals stipulated in Article 6, the requirement that the worker passages a Korean language proficiency test stipulated in Article 7, clause 1 and the requirement that the worker completes an employment training course stipulated in Article 11 shall not apply. ③ Re-employment after re-entry allowed in clause 1 of this article is limited to one time and Articles 18, 18-2 and 25 all apply with respect to the employment activities of foreign workers who have re-entered the country per clause 1. ④ The procedures for employers’ application for permissions of employment per clause 1 of this article shall be established by a Ministry of Employment and Labor ordinance. 2. If it is found and announced by the Ministry of Employment and Labor that social norms would recognize a foreign worker as unable to continue his/her employment in the place of business due to temporary shutdown, permanent closure of business, cancellation of the employment permit per Article 19, clause 1, limitations on employment per article 20, clause 1, violation of stipulated working conditions or unfair treatment by the employer or any other cause or event unattributable to the foreign worker.